Throwing out fruit wastes money. But, no one likes to eat mushy, overripe produce. 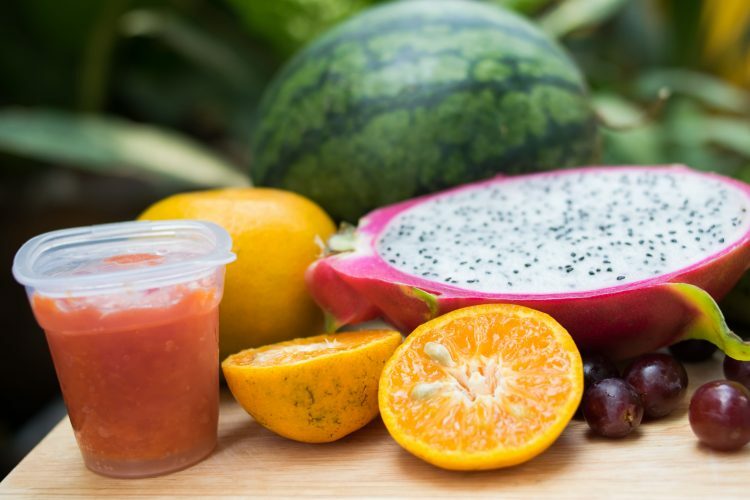 We’ve rounded up some fun ways to salvage our fruit, limiting our waste. Note: If your fruit is moldy and not just mushy, throw it out. We don’t want to eat mold! We found that overripe fruit adds a bit of sweetness to smoothies. Peaches, bananas, and berries are a fantastic addition. If you need a good smoothie recipe, here’s a post with five different ones for you to try. Just use your overripe fruit and proceed as directed. When we had some overripe plums, we decided to try making some fruit leather. It was simple. We just tossed our pitted plums into the blender and turned it on. When our plums were pureed, we spread it on a silicone mat on a cookie sheet. Then we placed the pan in the oven at 140 degrees and let it bake all night long. After 8 hours, the puree had lost its stickiness, and we could peel it up. We cut it into strips, and placed in a zip top bag to store. Preheat the oven to 350 degrees Fahrenheit. Line a muffin tin with liners, or spray well with non-stick spray. Mix well. In another bowl, place three peeled, overripe bananas. Using a fork, mash the bananas. Add an egg and 1/3 cup vegetable oil to the smashed bananas. Stir in a teaspoon of vanilla extract. Carefully add the wet ingredients to the dry ingredients and blend until just moistened. Fill prepared muffin tins halfway. Bake for 20 minutes, then remove from pan. Let cool. We love these served with a bit of butter and a spoonful of strawberry jam! We love how quickly a fruit crumble comes together. Whenever we have overripe peaches, strawberries, or apples, we create a crumble for dessert. After preparing the fruit by washing and peeling, we slice it directly into a greased 8X8 inch pan. We sprinkle the sugar and cornstarch on top and add in the lemon juice. After stirring, we let the fruit sit while we prepare the topping. In a small bowl, we combine the flour, brown sugar, baking powder, and salt. Then we cut in the butter. Once the mixture looks like crumbs, we sprinkle it on top of the fruit. Then we put the pan in a 350-degree Fahrenheit oven and let it bake for thirty minutes. We think it’s best served warm with a scoop of vanilla ice cream! Using our overripe fruit helps us reduce waste and save money. For even more money saving tips, be sure to read other posts on the iRazoo blog. If you don’t have an iRazoo account yet, sign up today!